We understand that there are no off-the-shelf solutions in waste management. A service staff of Somat engineers uses their expertise and insights to provide customers and consultants with application advice tailored to their unique needs. Somat is extremely responsive to customer requests and need for quotes—we are known for fast turnaround. If you are working on LEED Certification, Somat is ready with application support. It’s why the GSA/Department of the Interior foodservice operation chose a Somat waste reduction system to reduce waste volume and hauling expenses while applying to earn a LEED Gold Certification. Somat is the recognized leader in pulping and other waste management equipment that is transforming our industry and our world. No other company has the breadth of proven capabilities in foodservice waste management and reduction. Our line of pulping, extracting, shredding and dehydrating equipment and our ability to offer turnkey pre-sale to post-sale support is unparalleled. We engineer and manufacture waste handling systems utilized in wide-ranging applications globally. In fact, Somat units circle the globe on every surface ship in the U.S. Naval Fleet. 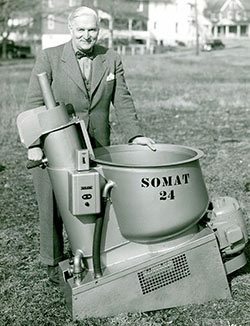 Somat has a culture of innovation in sustainability dating to the 1940’s when Kurt Wandel, a German immigrant farmer and inventor, developed a small pulping unit for home gardeners. The pioneering spirit to continuously bring to market smarter concepts and equipment that reduce waste and develop sustainable solutions still burns brightly at Somat today. Somat’s innovative spirit convinced Elizabethtown College to partner with us when its dining facility wanted to turn food waste into electricity—a “first-of-its-kind” project for both the school and Somat. Based in Lancaster, PA, Somat Company is a member of the Illinois Tool Works Food Equipment Group—ITWFEG. Dating back to the 1940’s with Kurt Wandel’s development of waste pulping systems, Somat Corporation was born in 1962, when Wandel sold his interests to a group of investors. In 1999, the Somat Corporation was acquired by Illinois Tool Works and became the Somat Company. One thing has remained the same since Kurt Wandel’s beginnings—our innovative spirit. It has earned us global recognition and accolades such as the NRA’s Kitchen Innovator Award for our groundbreaking efforts in engineering and producing waste management equipment. That history of innovation is still transforming the industry.